We stayed as close to La Casa as we could, taking over a dozen rooms at a local beachside motel and an entire second story deck with an ocean view. We gathered for music and prayers on the sand in the morning, shared several communal meals, celebrated mass on the beach and spent one morning working in the Shalom Garden at La Casa de Maria and touring the property. As we worked in the hot sun, we blessed our beloved spiritual home not only with our sweat, but also with our tears and songs and laughter. The devastation we saw there was both sobering and sanctifying. It is clear that Family Retreat will not be returning to the property any time soon, but equally clear that La Casa de Maria itself will continue its mission of being a holy place of healing and service for the world. We took a lot of pictures, but left some banners of hope in our wake. One of the traditions the team felt strongly we wanted to continue even at “Family Camp Lite” was time for family affirmations and reconciliation. During a normal week, each of these rituals are given their own sacred time and space, but in our condensed schedule, we only had one chance on Saturday evening and they invited me to share a few words, which I’d like to share here with all of you. Tonight we are combining two of our most cherished rituals from Family Retreat – affirmations and reconciliation. When we get started, each family will have to decide what they want to emphasize. Do your people need to hear, “I love you and here’s why,” or “I’m sorry and will you forgive me” more? Of course, both of those messages are deeply intertwined and deeply necessary, so maybe there will be time for both. How many married couples here had these lines read at your wedding? (A few hands were raised) How many of you have heard these lines at almost every wedding you’ve attended? (Most hands went up) Do they feel trite and commonplace? Probably. And yet, if we can get past our familiarity with the passage, I hope some tender part of your heart can still be touched by hearing it, is still open to the radical beauty of a Love like this, and still invested in living out this kind of Love whenever humanly possible. In 1 John, there is a simple, but powerful statement: “God is Love” and “everyone who loves is born of God and knows God,” which means that everyone is born of God and at some point in their lives has known God, because we are all born knowing how to love. We are born knowing how to connect, how to make eye contact and seek comfort in a warm embrace, how to forgive and draw near again. I’m not saying every child in the world is created out of love, or is born in a loving home, but Love is in our DNA. In fact, Love is our Divine DNA. It is only through repeated rejection, difficulty, suffering, hardship (and a thousand other things that happen to us over the first decade, or two of our lives) that we forget how to Love and separate ourselves from God, separate ourselves from our internal awareness of our Divine birthright as daughters and sons of God, made of Love and made for Love. I think that’s why Family Retreat has become so important to so many of us! We know and have experienced on a deep, deep level what happens when we give up a week of our lives, a week of vacation time, two weeks’ paycheck – all the things we sacrifice to be here – in order to participate in reclaiming and reframing our identity and our family’s identity in Love. The other 51 weeks a year, though we may spend time with our Bibles, or go to church weekly, or even lead deeply spiritual lives, we are still immersed in a culture that values other things more – productivity, success, consumerism, critical thinking, busyness, sports, appearance, power, security. It’s a relentless onslaught of not-love, a constant denial, or derailing of what matters most. So we come here for a week, or a weekend like this one to reclaim the power of Love, to witness what Love can do in our own family and in the families that surround us, to be reminded of and to strengthen the Love that flows between each of us and our Source. God, our Creator, Jesus, our brother, and the Holy Spirit, our Advocate, which simply a fancy word for our defender, or protector. One of my teachers, Cynthia Bourgeault, an Episcopal priest and author, takes this passage from Corinthians and offers a new way of looking at it in her book Love is Stronger than Death. It came across my desk just this past week, but I’ve thought a lot about it and how it might change everything we think we know about Love. When we gather with our families in a few minutes, perhaps we can think about how our family can Love like this. For Love to bear something is not just to “grin and bear it,” to put up with something we dislike, or is causing us pain and suffering. It can mean that, but to “bear” also means to give birth to, like a child, or to make fruitful, like a vine, or a fruit tree. Love “bears,” or brings new life wherever it shows up. That’s how you know it is truly Love, not a facsimile. If it isn’t bringing, or sustaining new life, it’s not Love. Paul isn’t talking about magical thinking, about believing in fairy tales, or romantic myths. While it might mean giving people the benefit of the doubt sometimes, Loving doesn’t mean letting people lie to, or manipulate you. But in almost every critical situation, we will have a choice between a response that leads to openness and continuing possibility and one that closes off possibility and leads to cynicism and despair. To believe when we are alive in the spirit of Love means that we try to stay open and imagine the highest, best possible outcome and then work toward making it happen. Hopecan be a response to a history of positive events. Good things have happened in the past, so we allow ourselves to hope that more good things are coming. But there is also a deeper hope based in Love, a fountain in the center of our hearts that will not let us despair, at least not for long; it just keeps bubbling up. With Love, in Love, it never runs out. When we Love and are in touch with the source of all Love, hope is the natural outflowing. To endure is to abide, to continue to stand, not rigid like a brick wall, but supple like a willow tree. Love like that allows us to sway in the gales and yet hold our ground: flexible, rooted, injured perhaps, but ready to rise again. We could read this to understand that Love never makes mistakes, or that if we do, we must not be loving enough. Or we might believe that if someone fails us, they must not actually Love us, but maybe that isn’t the whole picture. Crops can fail, and not yield a harvest, be destroyed by the weather, or by blight, or bugs. But Love never fails like that. Love will always rise up; it will always produce a harvest. We might not know what seeds we have sown with our love but Loving will always produce an abundance of something this world needs, even if we don’t get to see the fruits of our labor. As you gather here tonight and share your Love for one another, perhaps you can think about some of these things. How does your family’s Love bear fruit in this world? How has believing in each other allowed your family to heal? How has Love allowed you to hope, even when things seemed hopeless? What has your family endured, not easily, or without injury, but faithfully rooted in the Love you have for each other? Overall, “Family Camp Lite” came together even better than the team imagined it might. Families laughed and cried, prayed and played, talked and reconciled. We celebrated what had been and saw a glimpse of what still might be, both for La Casa de Maria and ourselves. Our family returned last week from La Casa de Maria Family Retreat. The theme this year was “Living Peace in a Wild World.” It was a beautiful week: relaxing and exhausting at the same time. I usually come back from Family Retreat full of ideas I want to share, but this time, I struggled. With at least a half-dozen drafts sitting on my desktop, none of them were quite right. Also, it’s summertime, which makes it extra hard for me to buckle down. I have to take care of all my usual responsibilities, but afterwards… my kids are around, the sun is shining, the water is calling. You get the picture. And now it’s Sunday morning, Monday night, Tuesday afternoon, Thursday morning. I hope you don’t mind if I just get the conversation started, even if it’s not as polished as I’d like it to be. The retreat team had our first meeting to discuss the 2017 theme just days after the election of President Trump. Emotions were high and if we wanted to work together, politics had to be off the table. The retreat wasn’t for another eight months, but we agreed they should remain that way. But at the same time, we wanted to address what is so clearly needed in our world right now – PEACE. How could we and the families on retreat more truly become the peacemakers our faith calls us to be? How could we learn to be part of the solution, instead of the problem? Each day at La Casa, we tried to address that question. On Monday, we talked about how to make peace with others in the wider world by recognizing that what we have in common is far greater and far more important than what makes us different. We can’t hold hatred, prejudice, and self-righteousness in our hearts and be peacemakers. It just doesn’t work that way. We’ve got to hold space and grace for difference – of color, orientation, nationality, religion, politics. That doesn’t mean we have to agree on everything, but that respectful dialogue is essential. In fact, when we drop our impulse to attack, or condemn, we can actually learn to appreciate and celebrate “the other,” (which obviously makes for a more peaceful world). The day ended with this great reminder from Heineken. On Tuesday, we explored how we can make peace within our families by recognizing that we have each been made in the image and likeness of God. We used a quiz to discover our “True Colors:” Good as Gold (reliability and rule-following), Genius Green (justice and investigation), Beloved Blue (relationship and heart) and Optimistic Orange (spontaneity and freedom). Although it was fun to find out more about ourselves and family members, the point wasn’t about identifying our “color.” Peacemaking comes by recognizing that our differences aren’t weaknesses, but rather strengths we can appreciate. Respecting each other’s unique gifts and ways of operating in the world is actually a way of honoring God’s divine plan for difference and diversity, embedded in the very fabric of creation. On Wednesday, team members gave beautiful testimonies reminding us of this big truth. Life is never simple and the more we insist that it make sense according to our own limited perspective and understanding, the less peace we will have. Only the wisdom of the Holy Spirit allows us to make peace with the paradoxical nature of life. The major themes of the gospels were alive that morning in the stories that were shared as we heard how the more gifts we’ve been given, the more likely we are to squander them, that losing everything can make us more willing to give it all away, that tragedy can bring reconciliation and that sometimes, death can even bring healing. Remember the line from the hymn so many of us sang when we were small from the prayer of St. Francis? We might still sing it in church to this day, but have we ever considered that we can’t give what we don’t have? Peace can’t begin with me, if I don’t have it in the first place! So on Thursday, I invited the retreat community to consider what it means to find inner peace, beginning with our own bodies. Too often, we think of science as something separate from our faith. Our churches haven’t done us any favors on that front either, but if we believe that God is our Creator and that we are beautifully and wonderfully made, then we can see how we are biologically hard-wired to make peace. In conflict, our heart rate elevates; our muscles twitch and tense, and our breath gets really shallow. That’s how our bodies respond to stress – courtesy of the Divine wisdom of our biology. Yeah for the flight-or-fight instinct! Because of you, we survived as a species! But in a world that moves so fast and is so full of tragedy and trauma and conflict, our bodies are on the verge of high alert all the time. Conflict and stress are the air we breathe. But we have also been given a gift in our ability to calm our central nervous system, particularly by controlling our breath. When we slow down our breath, when we make it deeper and longer, we also change the state of our bodies. We are creating peace within, which gives us a lot more freedom to decide how to react to things. That’s Divine wisdom we don’t hear nearly enough about. I began with a guided breathing meditation from Plum Village for the little ones and then I asked everyone else in the room to chant with me. I knew it was a risk, like nothing we had ever done before, but chanting is an ancient part of our faith tradition. For thousands of years, people in in religious communities have chanted the Psalms, multiple times a day. And if you are a part of the evangelical tradition, you might think of chanting as the proto-type of the modern-day worship experience – where a worship pastor repeats the same low, steady chorus over and over again, so the whole congregation can find the same rhythm of breath and sound and experience the same emotions. Chanting allows us to regulate our breath, slow down our heart rate, and create a peaceful place within ourselves. We used the most famous lines from Dame Julian of Norwich, the medieval English mystic. All manner of things shall be well. The response blew me away. I had hoped to get a few people chanting with me, but the whole room participated fully for several minutes. And I’ve heard from quite a few people that they’ve kept it up since they’ve been home! And to get the benefits, it doesn’t have to be chanting; any type of intentional breathing during prayer, singing, yoga, sitting, or meditation will help us increase our experience of inner peace. One of my favorite quotes about peace comes from Etty Hillesum, a young Jewish woman, an artist, activist and writer who was killed during the Holocaust. Creating peace within ourselves an essential part of becoming a peacemaker, but it’s too often neglected. I think that was one of my main takeaways from family retreat this year. We can get so focused on making peace that we forget to be peace. A peaceful presence will do more to change the world than any activism we might take on. I want to close with this reflection on peace offered by a young woman at a church service I attended. She began with John 14:27: Peace I leave with you; my peace I give you. I do not give to you as the world gives. Do not let your hearts be troubled and do not be afraid. Peace is a balance between light and dark, happy and sad, warm and cold, fire and water. It’s at the center of a wheel of opposites. I was blown away that this almost-child was so attuned to what slows her down, unites her heart with God’s heart, makes her feel safe and content, in harmony with herself and the world around her. She cherishes all that brings her peace and honors it in the telling. When was the last time you felt at peace in your own body, in your own home, or in the world? That’s my invitation to you this week. Take some deep breaths. Come home to your own body. Let your mind wander. What and where and who brings you peace, so you can be a peacemaker, first and foremost at peace yourself? If you are as brave as the young poet, share three places of peace you experience on a regular basis here, or on my Facebook link! 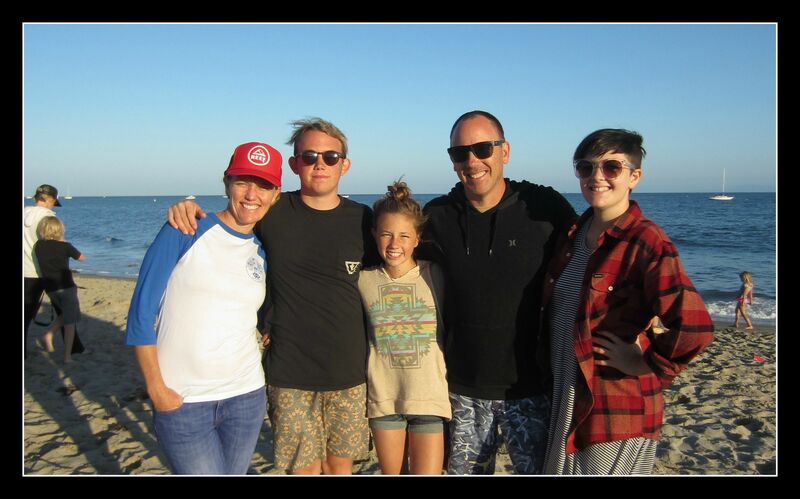 This past week, our family was at the Happiest Place on Earth: Family Camp at La Casa de Maria in Montecito, CA. We’ve been back for three days, but I’m just now coming home to Gabacho Drive, here in sunny San Diego. I’ve been working and cooking and cleaning, but until this afternoon, I was just going through the motions. My head was in the clouds and my heart was broken, with pieces of it scattered across the state, carried off by the people I love. Some of them I’ve known since the day they (or I) were born, some I met just last week. Heartbreak is a funny thing, because it can happen by Love or sorrow, with tears of joy, or pain. But both kinds take time to heal and regardless of the cause, you are never the same again. After three days of centering prayer and reading, after seeing and talking to my people back home, most of my heart is back in my chest, but not all of of it. That’s one of my favorite things about camp; if your heart is open and you are willing, you never know how you will be put back together again. I’ve written a few times about Family Camp- you can catch up here and here – but to be clear, here are a few more things you should know. My family goes to Family Camp, but Family Camp isn’t just for my family. Some of us share a name, or DNA, but most of us don’t. It is called a Christian family retreat, but that doesn’t mean it’s denominational, evangelical, or fundamentalist. Our “fundamentals” are Love, forgiveness, inclusion, acceptance and healing, as exemplified by Jesus the Christ, but our “good news” is that we’re all in, baby! Unlike retreats put on by industry professionals, Family Camp is run by a team of volunteer families who draw on their own gifts, experiences, faith and forty years of tradition to create a safe place for families to draw closer to each other and God. I had two opportunities to speak and share my ideas this past week, and many opportunities to listen and learn and since you weren’t all at Family Camp with me, I thought I’d share a few of these moments with you. Today will just be something I shared, but I hope to gather a few more thoughts from my friends who also spoke. The theme for this past week was Seasons: the seasons of the year and the seasons of our life, what they offer us and how we might approach them. We began with Summer, worked our way through Autumn, and Winter before being reborn in Spring. The artwork and presentations were beautiful in really creative and non-professional ways and I don’t mean that as a dis to our team, as much as a reminder that we aren’t putting on a show, so much as creating a loving, but imperfect home. For my own growth and benefit, that’s what I tried to focus on in my talk – how to be grateful, everyday, for every moment, and every season, no matter what kind of weather I’m in. It’s a practice I’m working on, all the time, and I thought I’d share it with all of you. Now, I don’t know if that is entirely accurate, but I started looking and it did help me see God in a new way, in the joyful nurturing of the small, wild animals in my yard, in the majesty of the NASA photos I follow on Instagram, in the vastness of the ocean I float in, but especially through the seasons. There are times in our year when the sun is closer and there is warmth and abundance and seemingly never-ending days. The nights come, but they are moderate in temperature and short in length. But there are also times when the earth has moved away from the sun and darkness seems to be prevalent, and it is uncomfortably cold, and nothing grows and we struggle to survive and we feel like it’s the end of the line for us and sometimes we feel abandoned and angry, or scared. But it isn’t the sun (or God) that has changed positions, but the earth (or us) who moved. And it isn’t like the earth moved away because it was bad, or mad, or mistaken, or sinful. It just did; it’s the natural, cosmic pattern; it’s the way the universe works. You can count on it and this pattern is actually the very thing that allows life to exist, for our world and for our own selves to grow and evolve and thrive. Perpetual summer would lead to death, just like a perpetual ice age. And of course, in addition to summers and winters, there are all the in-between times – the falls and springs that have their own beauty and their own pain, but whatever season we are in, we know that it is not the last season; there is another one right on it’s heels, as soon as we get comfortable and used to the one we’re in, or right when we think we can’t stand it for another day, for better and for worse, the season will change; life will move on. And so if we are in a SUMMER time of abundance and joy and we have the sabbath space and time to reflect, then the natural response of our heart is going to be gratitude. And that’s what I want to talk about today. Gratitude is one of those words and concepts that has been talked about so much and is so overused that I was tempted to chuck the whole concept. Parents – How many times, in your hardest parenting moments, have you heard the voice in your head reminding you how LUCKY you are to have kids, even when they are screaming at the top of their lungs and leaking fluids from every orifice? How grateful you should be for every moment of their young lives, because time flies by? And how you will never get these days back to be grateful for every one of them? Sometimes, we hear the word and we just go, “ugh.” But Gratitude is so important that I thought I’d try to bring a fresh perspective to it, because it is going to be a theme of the week- finding something to be grateful for, something to appreciate about each season of life we are in – no matter what it is, or what’s going on. 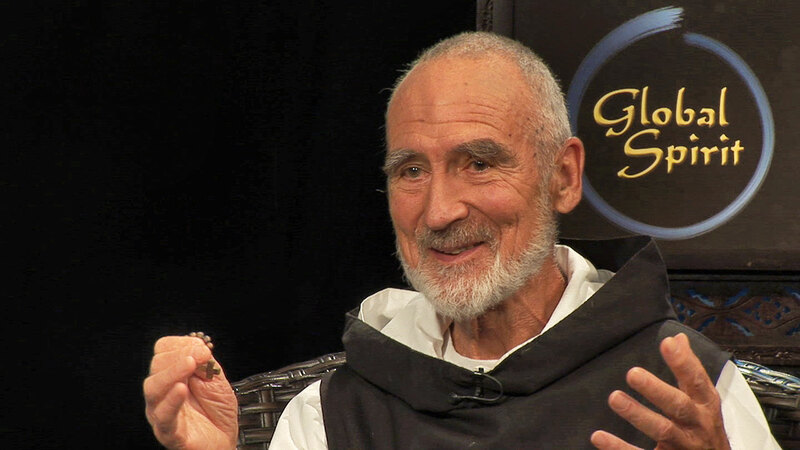 So I went where I always go for good ideas and found a TED talk by David Steindl-Rast, an Austrian Benedictine monk and he asked a really good question of his audience and I’m going to ask it of all of you. The answer is YES. They are both true, but not in the way we might originally think. Our default setting, our instincts tell us that if you are happy, you will be grateful. And if you are happy, it’s because you probably have a lot of things going right for you, but that is dead wrong. Some of the most miserable people in the world are the ones who seem to have the most to be happy about! They have all the money, the opportunity, all the privilege, all the connections and fame in the world. Everything the media tells us will make us happy doesn’t move the needle a bit. And sometimes the happiest people in the world have almost nothing. Gratitude is the X factor. It doesn’t matter how much or how little you have. If you have gratitude, you can be happy. You can’t choose to be happy, but you can choose to be grateful and if you start with gratitude, and live in a space of gratefulness, you will be happy. 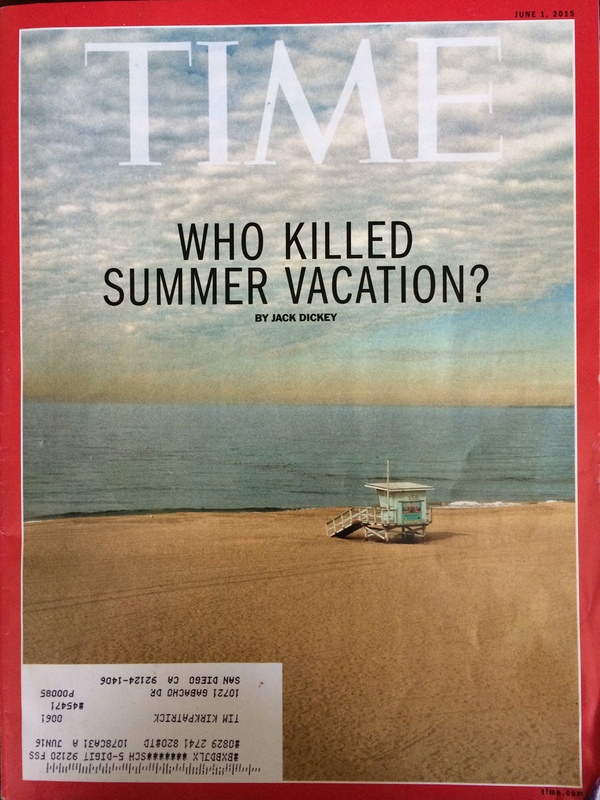 And summer is a time when it’s easier to be grateful, for many of us anyway and especially most of us under the age of 18, who get to be on summer vacation, or those of us who live in California. Sometimes gratitude happens spontaneously and we call these – Gratitude Events. A gratitude event is when we receive a gift – something we value – freely. We didn’t earn it, expect it, work for it; it just showed up. So that might be a really generous birthday gift from our parents, or an invitation to the movies and a sleepover from a new friend, or flowers from our spouse, but a Gratitude Event could also be a beautiful sunset, the smile of a newborn baby, or a spontaneous hug and kiss from our normally reserved kid. In those moments, gratitude just springs from our souls. Out of nowhere, a gift was given and our natural response is an upwelling of gratitude. For me, summer is full of those Gratitude Events. I won’t even list them all here, but you saw a lot of them in Tim’s video. Readers, you don’t have to watch the video, but it does capture some of my very favorite moments of being a part of Team Kirks. Whatever your internal thermometer is that tells you “your special season” – mine is set to summer. How many of you know what I am talking about? It’s like your Gratitude Event Meter is just pinging over and over again, all day long. How many of you have your gratitude event meter going off the charts in summer? How about Christmas time? Fall? The riot of color in a garden in spring? We all have a season, in the year and in our lives, when it’s easy to be grateful and that’s awesome. A sharp spike in our Gratitude Meter makes it so easy to be grateful and happy, but it’s unsustainable and so when the events aren’t rolling in, we can tend to get sad, feel deprived, or depressed and that’s a problem. And when it takes more and more to surprise us and make us feel grateful, that’s a problem too. How many of you have friends who seem to have everything they could want, certainly everything you want, and yet, they aren’t happy? They’re Gratitude Event setting is way too high. We need to learn Grateful Living – which is realizing that EVERY moment of our lives is a gift from the Universe, a gift from God. It’s something we didn’t earn. Every breath we take is a gift, and if we can learn to be grateful for that breath and then move even beyond that, we realize that in every moment we have the opportunity to find something more to be grateful for. That’s the thing about gratitude. You only need to start with one small ounce of it and it immediately begins to build on itself. If you can find one thing to be grateful for, you can find another and another. I want to share this poem by Carrie Newcomer with you. Though I read the poem during my talk, click on the link here to hear Carrie read it herself. Seriously, watch the video below. Hit start, close your eyes and enjoy ninety seconds of her beautiful voice, reminding you of all the simple, precious things in a life. And after the poem, look at this. People who wonder if the glass is half full or half empty miss the point. 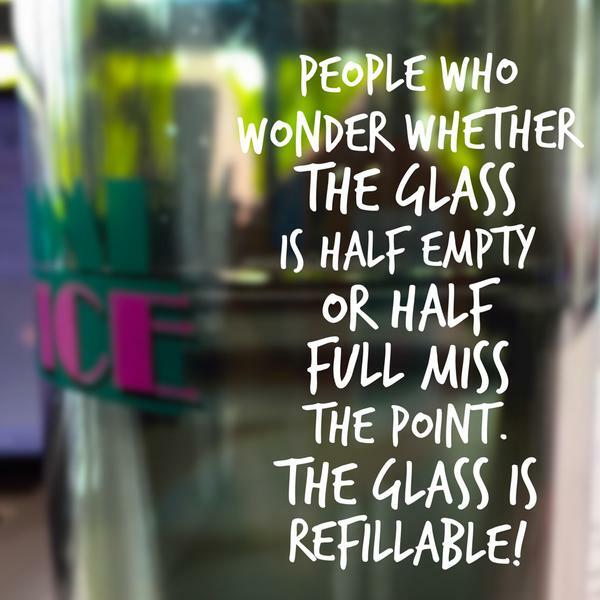 The glass is refillable. Whatever you want in your glass – you’ve got it and if you want more of it, it’s on the way. If it’s Joy or Gratitude, or Resentment, or Anger, or Envy, you’ve got it. It’s your glass. Each of us get to decide what gets poured in our glass. You want more happiness, gratitude, abundance in your life? Just fill it up! It may sound stupid, but it is a proven psychological phenomenon. Gratitude is an ever-expanding emotion. If you can find just one thing to focus on and be grateful for, then you will find another and another and another. Like Carrie Newcomer’s poem, it builds from just one simple deep breath when you can say, ”I am grateful for this breath, for the fact that I am alive and in this moment, I am not suffering. There is nothing I need.” Richard Rohr defines suffering as “anytime you are not in control.” We can all think of a dozen ways we are “suffering” right now, but we can also close our eyes, take a deep breath and realize that right here, in this moment, we have an abundance of everything we need – warmth, air, food, hydration, companionship, rest. We might not be suffering at all. David Steindl-Rast said the practice of Grateful Living can be taught, just like we were taught to cross the street when we were kids –What do you do when you get to the curb? You STOP, and then what? You LOOK both ways and then you GO. Seriously, who killed it? We did. magazine cover – we GO GO GO. All the world is go go go. And to be truly happy, which is to be grateful, we need to stop, instead of rushing through everything, trying to get to the next thing on our list, on our way to our goals. Steindl-Rast suggested we make stop signs for ourselves to remind us to take a deep breath. They can be mental ones – like prayers – when we wake, or at dinner, or bed time – when we can find, not just a general thank you, but a specific thank you. But they can be actual stop signs too. When he came back from living in Africa, he didn’t want to forget what a miracle it was to have clean, running water again, so he put a hand-written stop sign on his water faucet and on his light switch to remind him of the miracles of his life. We could put one on our mirror – dirty clothes hamper – steering wheel – computer screen at work. Once we have stopped and taken that first breath in front of the very thing that we take for granted, for which we can be grateful, even if it aggravates us, we can look around and find something else to be grateful for – the clean water, the electricity, the semi- healthy body that gets us around, even if it has wrinkles, the too many clothes we have to get dirty, and the washing machine we have to clean them, the car, the job, all of it and finally we GO; we embrace the moment and find JOY in it. When we enjoy it for that moment, it’s possible to have that gratitude inform and affect the rest of our day. 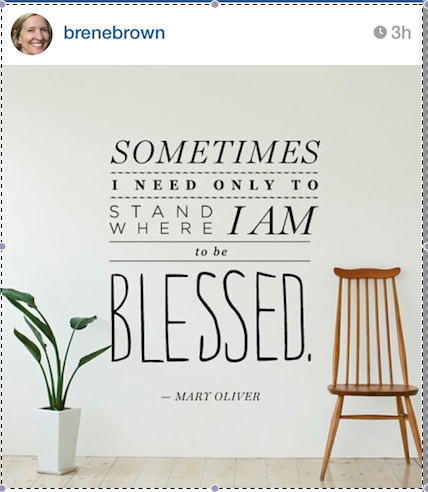 Of course, Brene Brown shared the idea. She’s full of ideas. In virtually every moment, there is something to be grateful for. That does not mean we have to be grateful for the bad things, the evil and tragic things. I don’t believe that. And if we find gratitude in the midst of bad things, it doesn’t mean we are glad they happened, or that the good outweighs the bad. It just means that even in this tragedy, in the midst of this hate, I can find some glimmer of Love, some glimpse of God. I think that’s what Jesus did on the cross when he asked God to forgive his murderers. Forgive them God. He found something to overcome the negative, even in his last breath, so that he could say in trust – Into your hands I commend my spirit. That is how I want to go, gratefully, free of hatred and resentment, and if that is the way I want to go, then that is the way I want to live. A line from recovery that I’ve heard is that you get to keep the gift by giving it away. And believe it or not, that is true of joy and gratitude, and love and kindness too. It’s been proven that it is almost impossible to sustain positive feelings if you keep them to yourself. You can keep your anger, your hatred, your resentment and doubts, all to yourself, all day, every day and they will grow and fester and flourish, but that’s because they are burdens. Gifts – love, joy, happiness – multiply if they are shared, given away and the more abundantly you share them, the more you have, until you finally realize there is more than enough. So I have one final thought. and as a mother, I know it’s true: we protect what we love. And I would just like us to think about the fact that if we aren’t consciously grateful and aware of the preciousness of the things we love, then our love can become habitual, and possibly even taken for granted, like a favorite old sweater, or stuffed animal, or favorite childhood story. You love it, but from distance, in your memory, or the image of what that thing is. And so staying actively grateful – conscious of the specific, ever-evolving nature of the people we love and the things that bring us joy, the people and things that make us feel whole, alive, excited – is so important. If we forget to love them actively, then we will forget to protect them in our hearts and minds, and even especially with our time. We want to Love well, protect well, enjoy and appreciate our lives and our relationships well, because we know what can happen if we don’t. We see it everywhere, all over – in families, neighborhoods and nations and across the world. I want to end with this song, “Grateful,” by a man named Nimo Patel, who has devoted his life to sharing a message of Love, service and gratitude. I especially love the chorus, which goes like this: All that I am/ All that I see/ All that I’ve ever been and all I’ll ever be/ Is a blessing/ It’s so amazing/ And I’m grateful for it all. I’m grateful for it all. For all of you: for old friends and new, for the family we are and the family we will become, for the life I have and the life I have yet to live, I am grateful. I have failed and will fail a million more times, but “There’s a million things to be grateful for,” and I don’t want to miss a moment, caught in fear, or self-pity, or resentment. So, every day, I will try to stop and breathe, look and go, hopefully, in gratitude. Remember that broken heart I talked about at the beginning of this blog? More than anything else at Family Camp this year, my heart was broken open by gratitude for the people I met, the Love I experienced, the stories and laughter and tears we shared. I was fully me, fully alive and aware of every gift: every baby’s smile, every toddler’s tears, every teen’s presence and every friend’s fierce hug and I thank you for it all. If you are interested in learning more about Family Camp at La Casa de Maria, you can go to the website here. On Sunday, my family returned from our week at La Casa de Maria Family Retreat. I’ve written about Family Retreat before, what it means to us and what it could mean to all of you. You can catch up here. Though I spoke throughout the week on a variety of topics, my favorite talk, the one closest to my heart, came on Thursday, when we open up the floor to any storyteller who wants to share. In those moments, before I handed off the mic, I was able to explore a theme that has been the focus of much of my journey over the last several months and years: the relationship between Fear and Freedom. The theme of the day was inspired by Momastery.com. This is their image. The words that follow are the ones I spoke last Thursday at Family Retreat. “Until Glennon Melton put those two words together, I had no idea they were related, but after I saw it, I wondered how I could have missed it. Sometimes, the stories that are the most sacred to us, the most holy, the most personal, are the ones we are the most scared to tell. What if someone doesn’t understand, or respect our story? What if they judge us, or treat us differently after we share it? What if our story includes something we did wrong, or that we don’t have a resolution for yet? It can be really scary to tell our story, because we don’t have the answer to those questions. Trust me when I tell you that it was really scary for many members of our team this week to get up and share their stories. We’ve done some things right, but we’ve also done plenty of things wrong and there were no guarantees on how you would experience it, or react to us after we shared it. But we chose to be story tellers, because of those two words up there. The parts of our stories that we are the most scared of can only become sacred, or holy, if we share them. If we keep our stories hidden inside us, God can’t use them to bless others. Only by overcoming our fear and sharing our life stories do they become sacred – tools that God uses to bless others and the world. When we share our stories, it also gives others an opportunity to bless us with their love and compassion. That’s what today is about – sharing our Sacred/Scared stories. The great Maya Angelou who died last year said, “There is no greater agony than bearing an untold story inside you.” And I believe it. And I believe the main reason we hold those untold stories inside of us is because we are afraid. I’ve been told that the most frequent command from God in the Bible is “Fear Not!” I’ve heard it appears well over 100 times. The association I have with the line “Fear not” is from one story in particular. Anybody want to guess which one? THE ANNUNCIATION, of course. So I never thought of “Fear Not!” actually being a command that God wants us to keep. I always thought “Fear Not!” was a command that really only applied because an angel had appeared and scared the heck out of you. But over the last few years, I’m beginning to learn differently. It isn’t “Fear Not! This super extraterrestrial being who just appeared out of nowhere won’t hurt you!” It’s “Fear Not. I am with you.” And that is a very different thing. I used to think fear was normal. I used to think fear was a tool God used to keep us in line, to keep us safe, or to keep us from making bad choices. But I don’t think that’s it any more. God has way better tools at God’s disposal than Fear. At one time, I would have been hard-pressed to say what the opposite of fear was. In my mind, the opposite of fear was just being “Not Afraid,” being in your comfort zone. But now I know that the opposite of Fear is FREEDOM. Freedom to take off the mask. Freedom to be ourselves. Freedom to speak our truth. Freedom to share our story. Freedom to step into our story, the one God has had on offer for us all along. This week I heard other storytellers say that same thing. While Todd and Amanda were a little afraid they were falling in love and afraid to tell everyone, their story could never blossom into the love affair that changed both of their lives and set them free to write a new chapter. The theme of Chase’s song “Leave” last night in the talent show was that he needed to be free and Ali needed to let him be free. As a mother, as someone who loved him, she encouraged him over and over to “Kick down the walls of resistance” that were imprisoning him. I don’t think those are just coincidences. Freedom is the key to any story inspired by God. Just the other day, I heard Erwin McManus, the founder of the Mosaic church, say that when he’s asked about who will have life after death, he says it’s the people who have life BEFORE death. We do not have life if we are afraid. Freedom is God’s desire for us. Not freedom to commit sin, to act without consequences, to tell lies, to live our lives however we want, but rather Freedom from the lies we tell ourselves. Freedom from sin which always rears its ugly head when we are living a false story, the one that tells us we are separate from God. Fear makes us Scared. Freedom allows us to make our lives Sacred. Twenty-three years ago, when I got pregnant with my daughter Sarah and gave her up for adoption, I was terrified of people finding out. I did everything I could to keep her existence a secret from virtually everyone I knew and for almost a decade, virtually everyone I met. As long as I was scared to tell that story, it was not truly sacred. While I was afraid, I was never free. And the person I was most afraid of telling that story to was my future husband. The story I was telling myself was that I was damaged goods. I was afraid I was unworthy. When I was 19 years old and pregnant, I was already afraid of my future story. And ironically, or rather, perfectly in God’s way, God set me free from that story when I was seven months pregnant and met Tim. I never had to tell the story again. The Truth set me free and when I was brave enough to share my story with others, it set others free as well. When I finally started to share my Sacred/Scared, many girls have come to me pregnant, unsure of what to do, but who look at my story as one of possibility and redemption. But it didn’t start that way. It started with me, sitting in my scared and them, sitting in their scared, with no possibility of a sacred Love to be born. Today we are asking all of you, the Storytellers who have been among us all week, but who haven’t gotten a chance to share a story with us yet, to come on up and share a story. It might be scary; but I promise you, it can be sacred. It will be a little of both, but we are here, knowing that “Listening is an act of Love,” one that we all want to participate in. So please, if you have a Sacred/Scared to share, if you feel that little flutter in your chest, please consider sharing your story with us. Today is your day. It doesn’t need to be long; it doesn’t need to life changing. But if you would like to share, we’d like to hear it and be blessed by it. It does not matter if we are rich or poor, strong or weak, male or female, old or young, gay or straight, black or white. If we look at our stories honestly, we will all find ourselves in the characters Jesus healed and set free with his forgiveness: the lepers, the lame, the woman at the well, the Lazarus in the tomb, and perhaps, most especially, the disciples who abandoned him. And if we understand that our stories follow the pattern of the Christ, we will also reach out and set others free. It may be by feeding the hungry, comforting the afflicted, lifting up the oppressed, or simply standing in loving acceptance of each other, until such time as our assistance and opinion is desired. 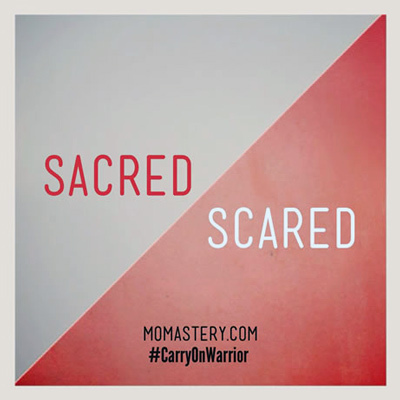 The Scared can only become Sacred if unconditional Love is the primary directive and that is what I love about Family Retreat at La Casa de Maria. For over 40 years, the experience has brought families to greater Love and greater freedom. It has helped them tell better stories. Those stories have changed their lives, homes, communities and the wider world. Family retreat is the light on a hill, the mustard seed that grows, the yeast that changes everything and I, for one, am going back next year. Steven Covey, business leader, speaker and author of The Seven Habits of Highly Effective People, and several other books, died yesterday at 79, surrounded by his family, which I’m sure is how he hoped to go. Personally my family owes a debt of gratitude to this man. Covey came into our lives at a critical juncture and transformed our family culture. Tim and I actually spent a lot of time this past week, praising this man’s ideas, and sharing the impact he had on our lives, with no idea that this week would be his last. When Tim and I had two children in quick succession in the late 1990s, we were in a world of hurt. We had gone from being two people deeply in love to a family of four in less than two years. After six years of romantic hand-holding, we were thrust into an endless game of ring-around-the-rosy, where we both fell down at the end of the day, feeling exhausted and underappreciated. Though we were still in love and had the family we always wanted, our way of relating to each other was unsustainable. Something had to change. Enter Steven Covey and his Seven Habits of Highly Effective Families. After finding it, we declared Tuesday ‘book club’ night. We would take a week to read 10 or 20 pages and after the kids went to bed, we would discuss what we learned. We learned A LOT, from the “Emotional Bank Account” to “thinking win-win.” What we most appreciated was Covey’s focus on “the who you want to be,” from which all real change flows. Tim and I didn’t need the quick-fix parenting tips we found in Parenting magazine, or god-forbid, the Growing Kids God’s Way that was popular at the time. Those publications told us how to deal with a toddler’s temper tantrums, or a lack of sleep, but they left us essentially unchanged as humans, as adults responsible for these youngsters, as a couple in a life-long relationship. Covey shook us up right away with his trademark admonishment to “put first things first.” We learned quickly that the first thing any of us have to deal with is ourselves. Only when we begin there can we actually make changes, which become habits which last a lifetime. Between stimulus and response, there is a space. In that space lies our freedom and power to choose our response. In our response lies our growth and our happiness. While I spoke about the importance and power of loyalty and love within our families and world beyond, I had to keep my comments brief. We weren’t the only ones there to share our stories, but if given the chance, I could have told story after story of how Covey’s work has altered me and the way I choose to be in the world. Today, I honor Steven Covey, the man, with my thoughts and words and prayers, but every day for the past 13 years, we’ve tried to honor his work and mission with the way live our lives. By “putting first things first,” and “beginning with the end in mind,” we’ve managed to stay on course. By remembering that our kids “won’t care how much we know until they know how much we care,” we’ve been able to put Love before the Law. If you’ve never had the pleasure, or privilege of reading The Seven Habits of Highly Effective Families, you can pick up a copy here. If you have read it, please take the time to share a story of your experience with his wisdom, humor, and grace in the comments section below.